Amirazodi*, Y., Zarshenas, M., Abolhassanzadeh, Z. (2017). An overview on Phyllanthus emblica: phytochemical and pharmacological investigations. Research Journal of Pharmacognosy, 4(Supplement), 71-71. Y. Amirazodi*; M.M. Zarshenas; Z. Abolhassanzadeh. "An overview on Phyllanthus emblica: phytochemical and pharmacological investigations". 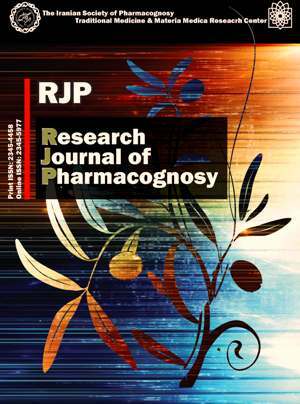 Research Journal of Pharmacognosy, 4, Supplement, 2017, 71-71. Amirazodi*, Y., Zarshenas, M., Abolhassanzadeh, Z. (2017). 'An overview on Phyllanthus emblica: phytochemical and pharmacological investigations', Research Journal of Pharmacognosy, 4(Supplement), pp. 71-71. Amirazodi*, Y., Zarshenas, M., Abolhassanzadeh, Z. An overview on Phyllanthus emblica: phytochemical and pharmacological investigations. Research Journal of Pharmacognosy, 2017; 4(Supplement): 71-71. 1Department of Phytopharmaceuticals (Traditional Pharmacy), School of Pharmacy, Shiraz University of Medical Sciences, Shiraz, Iran. Student Research Committee, Shiraz University of Medical Sciences, Shiraz, Iran. 2Department of Phytopharmaceuticals (Traditional Pharmacy), School of Pharmacy, Shiraz University of Medical Sciences, Shiraz, Iran. Medicinal Plants Processing Research Center, Shiraz University of Medical Sciences, Shiraz, Iran. Background and objectives: Phyllanthus emblica L. (Phyllanthaceae), commonly known as Indian gooseberry, is an endemic plant to the tropical and subtropical areas in china, India and Thailand. The plant is extensively used in Chinese, Ayurveda, and traditional Persian medicine (TPM). In addition, there are numerous reports on pharmacological and clinical activities of gooseberry in current medicine. The present review was performed to compile the phytochemical and pharmacological data on P. emblica in order to draw a window for further research. Methods: Databases such as Scopus, ScienceDirect and PubMed were searched for the term “P. emblica” up to 1st September, 2017. Papers concerning pharmacology and phytochemistry of the plant were gathered and analyzed. On the contrary, agriculture and genetic contents were excluded. Results: Over all, 80 papers were selected. The herb revealed to possess anti-diabetic, anti-oxidant, anti-proliferative, anti-inflammatory, antidepressant, larvicidal, anti-asthmatic, antiulcer, anti-aging, anti-carcinogenic, anti-tumor, anti-genotoxicity, anti-microbial, anticholinergic, antispasmodic, gastroprotective, anti-plasmodia, and antinociceptive activities as well as antidote effect against certain elements. The fruits are also useful in brain and gastrointestinal diseases and can be beneficial in hearth protection. Remarkably, many of those properties have been mentioned in TPM manuscripts. Conclusion: Despite numerous pharmacological activities for P. emblica, there is still a gap between the in vivo and human studies which should be covered by more comprehensive and complementary studies. Many compounds have been isolated and elucidated from this plant which can be good candidates for various related activities and also as new natural medicaments in novel drug discovery.